Back in 2014, the team at Time to Change held a round table event that forced those of us who care about NHS mental health services to face an unpalatable truth. Which was that 1 in 3 people who used services experienced lack of compassion and even stigma from where you would least expect it, those working in those very same services. This finding has been repeated several times, and featured again in last week’s Mental Health Taskforce Report. In August 2015, I wrote about how this made me feel and about the Time to Change project I volunteered to chair here. And about the negative reactions it initially invoked here. Now it’s time to pop my head above the parapet again. Along with some amazing people, including 4 experts by experience and senior colleagues from our 2 pilot sites Northumberland, Tyne and Wear NHS FT and 2Gether NHS FT, we have carried out some action research directly with NHS staff to explore what gets in the way of compassionate care and the shifts in attitude that are needed. It hasn’t all been plain sailing. But we have learned a lot, especially about what works. And this week we are launching a campaign within 6 volunteer mental health trusts, which include our 2 pilot sites plus 4 others. From the early work with our pilots, we know that staff value time out in a safe place to talk about attitudes and values, and to discuss why sometimes they fall short of providing care to a standard they aspire. The materials are being made available online via Time to Change across the whole NHS. I want to make a few things clear from a personal perspective. We won’t shift attitudes by finger pointing and blame. The people at Time to Change know this. Their approach is positive, supportive and empathetic. They know what they are talking about. They have achieved measurable, sustained success in shifting public attitudes over 7 years of work. Our project with NHS mental health professionals builds on the same approach, tailored to local circumstances. We are acutely aware that staff who work in mental health services are under greater pressure than ever before. We know this from the hard-hitting findings in last week’s Mental Health Taskforce Report. Our project doesn’t deny this. But we are operating in the real world. And we have to start where we are now. Stigma is an ugly word. And the stigma of mental illness is deep-seated and far-reaching. It manifests in the way mental health services get side-lined. Two weeks ago, my old boss Lord Nigel Crisp published his report about access to mental hospital beds. With charm and precision, Nigel ticked off Nick Robinson on the Today programme for trying to change the subject to the junior doctors’ dispute. Nigel pointed out that it was illustrative of the very problem mental health services face, lack of sustained attention. And whilst the Mental Health Taskforce Report got top billing on the day it was published, we also know that it will disappear without trace unless we all stop talking and actually do something to turn mental health into a priority. Not all journalists are guilty of stigma. I thank Shaun Lintern at HSJ, Andy McNicholl of Community Care and Michael Buchanan at the BBC for their sterling work uncovering swingeing cuts over the past four years, which some still deny despite the evidence laid bare. Stigma exists amongst some politicians and parts of the NHS. The rhetoric of parity of esteem has been trotted out whilst at the same time commissioners, faced with unpalatable choices, are allowed to disinvest in those services people are least likely to make a fuss about, i.e. mental health. And not just in the NHS, but also the third sector, where much vital provision has been wiped out in recent years and is at least in part the cause of the current mental health bed crisis besetting most of the country. The unkindness I experienced many years ago from a nurse in A and E is repeated across acute hospitals and other parts of the NHS daily. 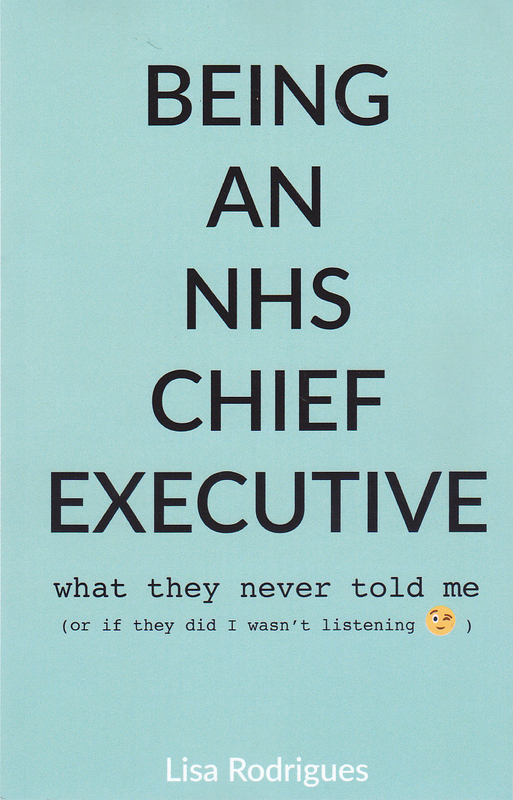 I recently heard an acute trust chief executive say this: “These people don’t belong in A and E.” (My italics). So who exactly are “these people”? They are people like you and me. And people like him think we are undeserving. And many, including him, still believe being mentally ill is somehow our own fault. Our Time to Change project isn’t aimed at tackling everything at once. We have to eat this elephant together, in bite size chunks. Working with Time to Change and supported by NHS England, I know we can succeed. It’s a good thing we don’t know what the future holds. Otherwise we might never get out of bed. On Monday, the long-awaited Mental Health Taskforce Report was published. And it made grim reading. Behind the awful stories about people being let down or receiving no treatment at all is the spectre of stigma. How else can it be that government ministers have spouted forth about No Health without Mental Health and Parity of Esteem whilst at the same time services have seen real terms reductions to funding far greater than other parts of the NHS. And despite referral rates continuing to rise? The suicide rate is rising again too, even among groups not previously considered to be at high risk. The coverage was wide and mainly pretty fair. (I say mainly; the Metro managed to annoy almost everyone on my Twitter feed with an offensive headline.) I was impressed by what Paul Farmer and all my other friends on the taskforce have achieved, and by the measured response of NHS England and the Secretary of State. But instead of feeling proud to have played my tiny part, and girding my loins for the sustained effort that will be needed to hold the government and the NHS to account, I noticed my mood gradually getting lower throughout Monday. By the evening, I was overwhelmed with sadness that it has taken so long for so many people to be heard, and that many lives have been lost along the way. And I was assailed with despondency and a sense of utter failure for what I hadn’t managed to achieve in all those years I was running mental health services and had so much opportunity and influence. Things got worse on Tuesday. I woke to find myself the subject of an article in my local paper, the Brighton Argus, along with a massive photo of me with a long-forgotten hair colour. It said that 19 staff at Sussex Partnership, the trust I used to run, had received severance pay-outs totalling several millions in the past four years, and that I had received the largest sum, £275k, in 2014. It was wrong in every respect. The highest payment was £27.5k not £275k. And I hadn’t received one at all. And I felt tearful and scared and powerless and all the other things I remember about being public property for the 13 years I was a chief executive. I minded most because leaving the trust caused me great anguish. Anticipating it almost certainly led to my last serious depression. Going back to work after my breakdown for another 8 months was very hard. It mattered greatly to me that, having managed to do so, I should leave on my own terms. As I left the house yesterday afternoon somewhat surreptitiously to do some local errands and keep an appointment to give blood, I wondered what people must be saying behind my back. And I was reminded what it felt like to have no place to hide. However, the week wasn’t all bad. I was asked to appear on Radio Surrey and Sussex this morning to talk about the stigma of mental illness as part of the BBC #InTheMind series. You can catch me, Danny Pike and the wonderful Sue Baker of Time to Change here 1hr 10 mins into the programme. Our choir has been rehearsing for a charity concert on Saturday afternoon – details here https://twitter.com/slondonchoir/status/699507596353499136 All welcome. Brighton and Hove Albion drew away on Tuesday night with Championship leaders Hull and are now third from top, and only one point away from an automatic promotion spot to the Premiership. And I have at last finished the first draft of my book, which is about being a chief executive who occasionally experiences doubts and depression. One day I hope you will read it. Update: I spoke too soon, which after 21 years following the Seagulls, I’ve found it’s easy to do. We got stuffed 4-1 yesterday by Cardiff City. Have a feeling this season could go right to the wire, just like every other year! But the choir concert was – well I don’t have enough superlatives. Life – affirming will do. And today I helped my lovely husband Steve, who supports me in all my endeavours, to raise money for The Tall Ships Trust, a youth development charity to which he is very committed, via a jumble sale of boat stuff. The two of us were up at 5.00 am. By 2.00pm, we had made just shy of £1,000 which will help kids from disadvantaged backgrounds to experience the joys and lessons that can be learned through sailing. And I’ve heard from hundreds of people who’ve said kind things. Which for someone like me means more than I can possibly tell you. On Tuesday I was in the depths of despond. Today, on balance, I’m really happy to be me. They say you should do something scary every day. I’m not sure. Although I do know that I need the occasional exhilaration of putting myself in an uncomfortable position and overcoming my nerves to make me feel fully alive. Such opportunities came along a bit too frequently when I was a chief executive. But these days I probably don’t scare myself often enough. 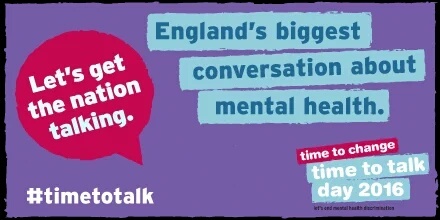 Today is the annual Time To Change #TimeToTalk day. Last night, the choir I recently joined held an open mike session. And I decided to terrify myself at the last minute by offering to do a turn. Although I can follow a tune and love to sing, I am not like the other wonderful acts that got up and entertained us. I have no special musical talent. But I can talk about stuff. So I found myself standing there and explaining to a packed pub why I had decided to join the choir. Which is that singing with other people is really good for me. Since school choir days, I have yearned to sing again in a choir. I am full of wonder at being part of something greater than myself. I love having to concentrate really hard in order to follow the music. It moves me when a piece we have faltered over suddenly comes together in glorious harmony. Singing with others of a much higher standard helps me to raise my own game. It feels visceral yet sublime. And I told them about my history of anxiety and depression, and the impact it has had on me, off and on, over 45 years since I was 15. I talked about stigma, including self stigma. And I told them them that I knew I wasn’t alone, because at least 1:4 people in that pub were like me, possibly more. I told about the research of the positive impact of singing on mental well-being. And then I asked them to join me and celebrate Time to Talk Day by talking to someone else about mental health. How did it go? Well, I was nervous of course. But they were lovely. I got clapped and cheered. There were a few tears. And some lovely conversations later. I shouldn’t really have expected anything else. The choir is amazing and our conductor MJ is not only a multi-talented musician. She is also an inspiring, compassionate leader. She gets the best from all of us, as singers but also humans. If you have experienced mental illness but feel shy about telling people in case they judge you, maybe you could do something scary today? Please think about taking the plunge and talking to someone about it, what you do to cope but also how it is only one thing about you. Talk to a colleague, a friend or just someone you happen to bump into. Use Time to Talk Day as your excuse. And ask them about their own mental health. Listen really carefully to what they say. I think you will be pleasantly surprised by your conversation. Whether you call it Seasonal Affective Disorder, the winter blues, even depression, January can be a wicked month for those of us who have problems maintaining our mood. The combination of miserable weather, not enough light, post-holiday flatness and getting back on the treadmill can feel pretty grim. So what to do? Reading breezy articles in lifestyle magazines might lead you to believe that the answers to your woes lie in spending money you almost certainly don’t have on new clothes, visits to spas, holidays or even a home makeover. Such advice can make people like us feel even worse. As can admonishments to start a new you via a radical change to your diet, new hobbies or an unrealistic exercise regime. When we are feeling low, stuff like this plays into the isolation and hopelessness that already beset us. We know we probably should do these things, but we can’t because we believe we are hateful and lazy and useless and undeserving and anyway, there isn’t any point because nothing will ever get any better. From my somewhat extensive experience of Januaries past, I offer an alternative list, proven, on the occasions when I have actually taken my own advice, to work. Stop being mean to and about yourself. You deserve kindness. Start thinking of yourself in a kinder way. When you find yourself putting yourself down and focusing on your deficits, turn this on its head and make a list of your assets instead. Practice being proud of who you are. Walk places, if possible every day. Walking is proven to lift our mood. It releases endorphins. And it’s free. The first ten minutes may be hard going but after that it will feel a bit easier. The rhythm of walking is soothing. It strengthens the heartbeat. And even if you find meditation impossible in the more usual way, walking will help calm any troubling thoughts. Tidy something small. Start by making your bed. Do the washing up. Put out some rubbish. Creating order in our surroundings helps to us to create order in our minds. Whatever you are doing today, do it to the best of your ability. Even if it something you hate, like cleaning or filling in forms. And at the end of the task, take pride in what you have achieved. Tell yourself you did well. And remember to praise yourself not for the outcome, but for the effort you put in to achieving it. Force yourself to talk to someone else. It may feel easier to hide away, but this is statistically proven to make things worse. Humans need contact with other humans. Parties and large groups can feel overwhelming unless you are at your best. Instead, arrange to have a cup of tea with a friend. Or pop round to see a neighbour. Ask how they are. And when they ask you, answer them honestly. If you are really isolated, think seriously about calling a helpline. If you are feeling desperate, please, please seek help. Try this wonderful app created by Grassroots, a charity I am deeply grateful to be associated with as a trustee. Or call Samaritans, who are there 24/7 to listen, without judging. They really can help. I know, as I’ve tried them myself in the past. January can be a horrid month for many of us. But we can get through, if we are kind to ourselves and reach out. Because, as the advert says, we’re worth it. To campaigning journalists @andymcnicoll and @shaunlintern for supporting underdogs including mental health care and people with learning disabilities. Please never stop. To Adam and Zoe Bojelian who lost their dear son @Adsthepoet in March 2015 but keep his legacy alive via Twitter. You are in our thoughts as you face a first Christmas without your wise, beautiful boy. We will never forget him and what he taught us. 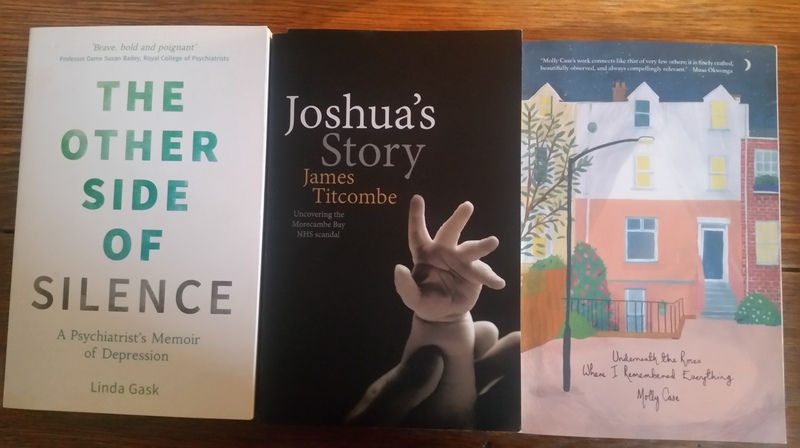 To @JamesTitcombe who lost his baby son and has courageously campaigned for greater openness over mistakes in the NHS, despite some vile online abuse. I treasure my copy of Joshua’s Story. And I thank James for all he continues to do to make the NHS safer for patients and their families. To all who bravely act as patient representatives, such as the indomitable @allyc375, and remind regulators, commissioners, managers and clinicians what the NHS is actually for. Only they know the cost of speaking up. Go Ally, @anyadei @ianmcallaghan @DavidGilbert43 and others who’ve earned the right to call themselves patient leaders. And to @HSJEditor for taking a risk and running the first HSJ list of patient leaders. Thank you Alastair. I think it was a game-changer. To those who’ve grasped one of the most feared conditions and are making life better for those living with it. I mean you, @dementiaboy and @dr_shibley. To you and others like you, thank you for refusing to leave dementia in the too-difficult box. To @Liz_ORiordan who is generously sharing her experiences of breast cancer care, which for a breast surgeon is a pretty massive deal. And for some other stuff. To @EastLondonGroup, who introduced many of us to a group of previously little known landscape artists from the early 20th Century. Sunday Morning, Farringdon Road has become a landmark of my week. And to @penny_thompson, for pointing me to ELG and for always being true to her values. To @HPIAndyCowper, for his excoriating, original analysis of the NHS, and for his support to me in my scribblings. To @clare_horton for running the excellent @GuardianHealthCare and even including some of my pieces. This meant so much. To @seacolestatue @EAnionwu @trevorsterl @thebestjoan @pauljebb1 @joan_myers and many others for plugging away in the face of seemingly impossible odds. The Mary Seacole Statue will rise in 2016 as a permanent memorial to someone who showed how, if something matters enough, we should never give up. To @nhschangeday @PollyannaJones @helenbevan dani_ellie @jez_tong @LydiaBenedetta @cjohnson1903 @WhoseShoes @fwmaternitykhft @DaniG4 @damian_roland and so many others for including me in NHS Change Day 2015. I was meant to be helping you but I gained many times more than I gave. To @TimetoChange @suebakerTTC @paulfarmermind @carolinewild @danbeale1 @2gethertrust @NTWNHS @rethink @mindcharity and a whole raft more for being a major part of my life this year, working together to tackle the stigma that still exists within the NHS towards folk who, like me, experience mental illness from time to time but are so much more than our diagnoses. Here’s to you. To bright, bubbly new leaders like @anna_babic and all those I’ve met via @NHSLeadership, who fill me with hope for the future. And to @Alannobbs @kirsti79 @NoshinaKiani and all the other great folk at the NHS Leadership Academy. You do stunning work. To @GrassrootsSP and everyone who works to prevent the long shadow cast by suicide. Thank you. To everyone who supported me in my bike ride for @samaritans in the summer. Especially @NurseEiri and @JackieSmith_nmc. They know why. To @Suzypuss whose book The Other Side of Silence has inspired me to get on and finish mine. To friends who also experience mental illness from time to time and who share their thoughts and feelings so generously. Thank you @BipolarBlogger @Sectioned @BATKAT88 @annedraya @clareallen @corstejo @schizoaffected @rabbitsoup_zola and many, many others. On a not-so-good day, yours are the tweets I look out for. You bring me hope. Posted in Christmas, compassion, depression, friendship, kindness, mental health, mistakes, NHS, NHS Change Day, NHS staff, patient leaders, Samaritans, stigma, suicide, thanks, Time to Change, Twitter, Uncategorized and tagged compassion, depression, friendship, kindness, mental health, nhs, NHS Change Day, patients, recovery, social media, stigma, suicide, thank you, Time to Change, Twitter on December 24, 2015 by LisaSaysThis.